The "Sword of Bedwyr" is the first book in the "Crimson Shadow" trilogy. the Young noble Luthien Bedwyr is too privileged to understand that his once-proud land, Eriador, suffers under the demonic oppression of Wizard-King Greensparrow. Until the day Luthien seeks justice for a friend's murder--only to become a fugitive fleeing the king's monstrous cyclopian soldiers. Befriended by the irrepressible "highwayhalfling" Oliver deBurrows, and enlisted by an ancient, mysterious mage, Luthien's exile will become an enchanted quest to steal a mystic prize from a dragon's hoard. 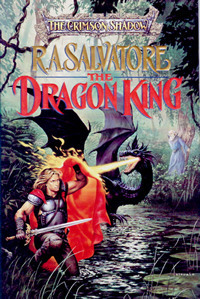 This is a unique book that is no some of Salvatore's best work, but is still worth a read. 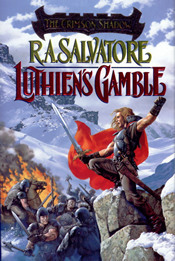 "Luthien's Gamble" is the sequel to "The Sword of Bedwyr". "Disguised as the magic-wielding outlaw called the Crimson Shadow, Eriadoran noble Luthien Bedwyr has struck the first blows for his people's liberation. But now his ragtag rebel army of elves, dwarfs, and humans must rally against the threat of a new war. As the evil Wizard-King Greensparrow marshals his forces of Cyclopians and demons, Luthien must brave Eriador's fierce winter and win more and more of its inhabitants to the Crimson Shadow's cause. The odds are against him--even more than he realizes..."
This is definitely the best book in the "Crimson Shadow" trilogy. It has a rich plot better than the first book and will keep you occupied. Then suddenly, Luthien is captured by Huegoth raiders and gains some astonishing information about the fate of his lost brother. Lady Deana Wellworth discovers that she is the rightful heir to Avon's throne. And the lord of wild, distant Baranduine begins a desperate campaign to free his land from Greensparrow. Now battle will be joined on mountain, plain, and swamp, on land, sea, and in the air--in a war of courage and dire wizardries. Yet in the end, all the valor of Eriador, and the daring of Luthien's magical alter ego, the Crimson Shadow, may not be enough to vanquish Greensparrow's ultimate weapon. For Greensparrow isn't merely allied with the hell-monster he plans to unleash: Greensparrow is the vast and terrible being that once withstood the combined might of the ancient Brotherhood of Wizards. And in centuries of plotting world conquest, the beast has murdered the sleeping mages. Except one. Heir to a dying magic, Brind'Amour must stand alone..."
This book is better than "The Sword Of Bedwyr" but is not as good as "Luthien's Gamble". However, some breathtaking battle scenes make this book a worthwhile read.